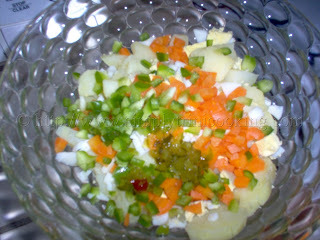 To end the week I leave with you a simple side dish that is a must with any Trini Sunday meal. Based on the amount of steps you’ll realize that’s it is not that difficult to make. Of course as I always say, you are welcome to experiment with it once you get the hang of it. Maybe try some bacon bits or olives or something else you like.I like to enjoy potato salad with a nice Sunday meal with red beans, stew chicken, water cress and rice. 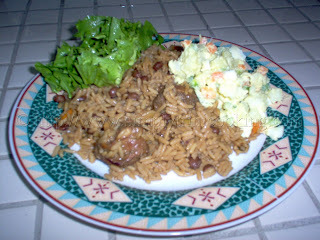 Or even with a nice fried rice or pelau etc. 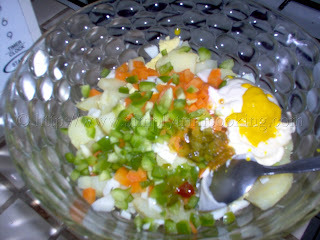 Anyhow, I will be short tonight so enjoy potato salad. 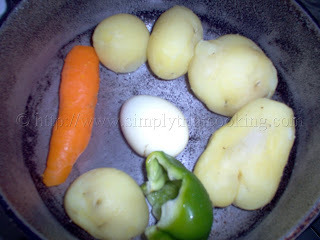 Some of the ingredients for the potato salad. Pour all the ingredients into a deep dish. 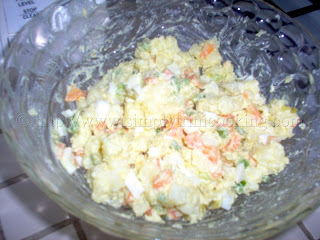 Mix the ingredients with the mustard and mayonnaise until the mixture is moist. No problem Talieeya. Thank you for stopping by. More recipes to come so stay tuned! Hi Felix. How many potatoes would be 1lb? I’m cooking for a family of 6, how many potatoes would I need? That depends on the size of the potatoes. Just weigh a pound of potatoes. i have lived in the island of trinidad and i loved it. there are so many dishes that i liked. thanks for this website now i can try all of them as my family loves them too. I learnt some years ago that 1 lb of potatoes is about 5 medium.